or, How community organizations can resist rent spikes, together! Tues, Oct 4: 5:30p doors open, 6:30p program. Speakers: Margot Black, Portland Tenants United; Robert Van Pelt, Tututni Siletz & Umatilla (SJAC board); Grant Neal, Casa Wovoka Native NA; Jonny Cool, local musician, and more! 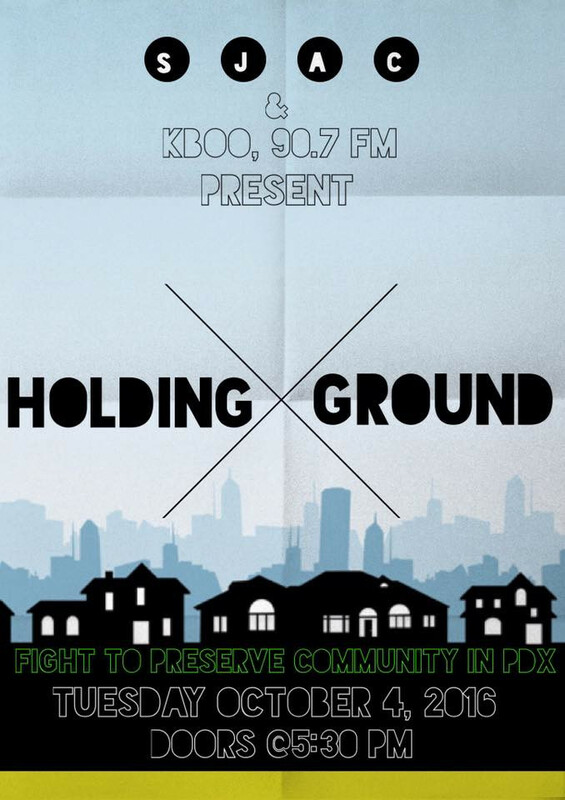 Rents in Portland are rising, and long-term grassroots institutions are being forced out. But the Social Justice Action Center is bucking that trend! Join us for a special open house at the Center where we share our model for grassroots organizing in the heart of Portland, especially by and for marginalized communities and organizers of color. We’ll have a silent auction, friendly music, and timely conversation about how to build long-term places for grassroots groups to share. Learn how you can get involved in this important moment as we raise the $20,000 we need to save our building and purchase it for community movements. Contributions to SJAC are matched dollar for dollar till we make our goal! It’s a commonplace that rents in Portland — for housing and for organizations — are through the roof, with landlords and developers making bank on affluent incomers, and the rest of us pushed to the brink. Many community groups that have played a vital role in creating the Portland that has attracted so many, are now forced to move or close. From radical bookstores to artists’ co-ops, from underground publishers to alternative cafes, many of those that don’t hew to the Division St. veneer (and have deep pockets) are being pushed out. This won’t last forever. But to keep community organizing strong — whether among marginalized communities that are increasingly forced to the perimeters of the city, or among creatives and radicals scrapping to keep the spark alive closer in — we need places in the heart of Portland as permanent homebases. Our conversation will feature people who’ve experienced the recent changes firsthand, and will discuss various approaches to keeping community places open and available. We’ll especially look at opportunities for our movements to own properties, protecting them from speculation, and how we can best get there — showcasing SJAC’s own current campaign to buy its building. Co-sponsored by KBOO, 90.7 FM.